First, you protect yourself by building an identity that is seemingly strong. Next, you start to shift the focus from ‘self’ to ‘others’. You drop your guard, confident that you can judge who is safe and who is not. You soon realise that there is no reason to have any kind of guard at all. Each stage on these journeys is self-fulfilling. When you see everyone as a threat you attract fights. When you see everyone as dangerous, you get hurt. When you begin to separate people into those you can trust and those you can’t, you create competition and politics. But when you can exist without judging others, you are truly open. This is probably the key to accessing vulnerability above the line; suspend judgement. This is a lesson I am learning every day. You lead best when the best version of you, leads the best version of us. So, can you be a leader and be vulnerable? Perhaps the better question is, can you see greatness in everyone, including yourself? I think the word ‘vulnerable’ is not very accessible. 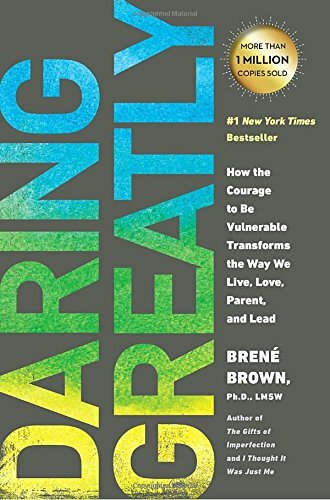 Dr Brené Brown has done a good job of explaining why it matters in her seminars and her books. The standard definition of vulnerable is being exposed to the possibility of being attacked or harmed, either physically or emotionally, i.e. "we were in a vulnerable position”. A synonym search for the word says that to be vulnerable is to be in danger, in peril, in jeopardy, at risk, endangered, unsafe, unprotected, ill-protected, unguarded. I think that ‘unguarded’ is the key synonym here. When we ask our leaders to be more vulnerable, we are asking them to drop their guard, to stop looking for the attack, to simply remove the fight from themselves. For this vulnerability prescription to take effect a leader needs to hear ‘vulnerable’ in the right way. It’s a classic above the line distinction (see previous Talking Point Above the Line) and a question of perspective. Below the line, ‘vulnerable’ means exposed to attack. Above the line, however, there is no attack. When you feel that the world is out to get you, being vulnerable is a dangerous thing. When you feel the world is you, you are free to access the power of being open. One of my dear friends, Michael Henderson, taught me that the key to this idea is compassion. When you see someone doing something you don’t like, or something that triggers you, run towards them and not away. The key phrase I was taught is ‘just like me’. If someone cuts you off in traffic you might run away from them, isolating yourself and others by getting angry. Alternatively, you might recall a time when you were the other person, in a hurry and driving selfishly, being self-serving. You realise the other driver is ‘just like me’. Seeing the world as ‘us and them’ is the small game; playing the game ‘just like me’ you begin to play the bigger game. The bigger game is the leadership game. It’s the game of love. This is why win-lose negotiating is a thing of the past and why it’ s so surprising when you still stumble across it in your daily life. It’s hard to imagine living in that constant state of fear, thinking ‘the world is out to get me so I better get my share first’. It is very ‘Walking Dead’. So, can you be a leader and be vulnerable? Perhaps the better question is, can you see greatness in everyone, including yourself? Imagine that a leader is given a performance review and told that they need to be more vulnerable. What logical next step does that leave them? The leader’s job is to give people confidence, not fill them with fears, right? This may be why some leaders struggle to be vulnerable; they fear that to do so is to expose the team to all that's on their mind. Perhaps the more constructive feedback would be that they need to be more open. Maybe it’s all about the words we choose. The concept of the vulnerable leader fights with the idea that we need strong leadership in times of change. So, can a strong leader can also be a vulnerable one? Thich Nhat Hanh often says that ‘the stronger you are, the gentler you become’ . In other words, by being strong, you can afford to be gentle. (On a side note, I am very excited for his new movie Walk With Me). By being strong, you can afford to be gentle. The juggle is between being open whilst also staying calm in the face of disruption. Leaders are often told that ‘calm is contagious’ (check out the previous Talking Point on this idea). This is a principle taught in many leadership classes, including in the high-performance world of the special forces. It is important to note here that being open does not mean opening your mouth without filters or thought. You can be open and keep the calm. Your job is to inspire confidence, yet your relationship also needs a depth that may require a level of intimacy, which leaves you feeling exposed and at risk. Are we intimate with another if we share secrets, expose weakness, allow drama to direct the relationship? And is this something you, as a leader, should pursue? For many, the only way they experience intimacy is through the mutual exchange of secrets. Tantamount to salacious gossip, this special access to your dreams and fears is the only way this type of person forms intimacy with you. This need to identify with someone else's drama is one dimensional at best. It is part of a fatally flawed assumption. Leaders inspire us, not just with their vision of what we should be doing, but also through their example. You don’t have to find drama, secrets or express your inner fears to achieve the intimacy often confused with vulnerability. Intimacy is something I think we crave, something we hide from, something we fall deeply for and for me, it’s a never-ending life lesson. Your job is to inspire confidence, yet your relationship also needs a depth that may require a level of intimacy, which leaves you feeling exposed and at risk. As the world goes high(er) tech, we may need to become more ‘high touch’. The rise of emotional intelligence over the last decade speaks to this effort to humanize ourselves. Daniel Goleman is the poster child of thinking in this space. Someone with high emotional intelligence has empathy and can connect with individuals, enabling them to work at their best. Someone with social intelligence can connect a team of people together to get more done. Stop fighting with and separating yourself from others. Phonetically, we can break the word intimacy down into the phrase ‘into me I see’. This is true, as intimacy with others is only part of the story. It is essential to be intimate with ourselves. As a leader, being vulnerable, is knowing yourself so intimately that you have a secure sense of self, an identity. After all, there is only one you; not a you at work and a you at home. My business partner, Pete Cook, says ‘how you do one thing is how you do everything’. Stop breaking you down into manager you, work you, home you. As a leader, it’s all you. Bring more of you to everything you do and we will all be better for it. This is what it means to lead from an open heart. You lead best when the best version of you, leads the best version of us.